In Coronado Island you will find townhomes and condos for sale in Coronado Village. Luxury beach front and bay view condos in Coronado Shores, alongside award winning Coronado Beach. The gated community of Coronado Cays, just 5 miles south of the Village, featuring bay front condos and townhomes with available private dock facilities for your boat. On the market for a home, condo or perhaps a vacation property in San Diego’s exclusive Coronado Island? Click the button below to see all currently listed Coronado condos and homes for sale. In Coronado Island prices for a 2 bedroom condo start from the mid $500,000 and ocean view condominiums start from $1,200,000. Call us today at (619) 921-0284 for more information and availability on Coronado condos for sale. 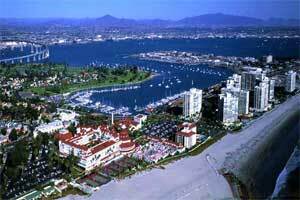 Besides top rated beaches, in Coronado Village is the world famous ocean front Hotel Del Coronado, Glorietta Bay Marina, the Coronado Municipal Golf Course, Ferry Landing Marketplace and downtown Coronado. The Coronado Village provides a collection of townhomes and condominiums within walking distance to the beaches, downtown Coronado shopping, upscale dinning and theater. Bay front condos include The Landing and The Point with gorgeous views of San Diego Bay and downtown San Diego. The ocean front Coronado Shores condos, just south of the Hotel Del Coronado and alongside Coronado beach combine the carefree lifestyle of beachfront condo living with spectacular panoramic views of sunsets over the Pacific Ocean, sailboats along Glorietta Bay, views of Hotel Del Coronado, and the San Diego skyline. The Coronado Shores luxury condominium homes consist of ten ocean front 15-story buildings in 32 acres of prime ocean front real estate, ideally located within walking distance of the new Coronado Community Center and nearby Coronado Village with its unique shops and restaurants. The Coronado Cays is an exclusive home, townhome and condo gated bay front community, just 5 miles south of Coronado Village and 10 miles southwest of downtown San Diego and San Diego airport and within walking distance to the ocean front Silver Strand State Beach. Coronado Cays is a popular vacation destination as waterways and wide channels provide most Coronado Cays home and condo owners with bay views and private dock facilities for their boats. Many of the dock facilities are included with the Coronado Cays home or condo and are located directly behind it. Call us with any questions on Coronado Island or information and current availability on Coronado condos for sale!